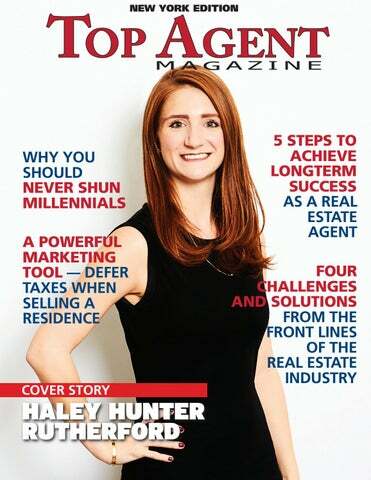 To learn more about Haley Hunter Rutherford, visit hhrutherford.com, email hrutherford@kwnyc.com or call 646.737.9672 www. AS A REAL ESTATE AGENT Real Estate can have a reputation as an industry with a high turnover as far as agents go. Being a ‘people person’ with an entrepreneurial spirit is a great start, but what some fail to realize when starting out is that this is a business. So if you’re in it for the long haul, you need to treat it that way. Here are some key steps you need to take to have your own successful real estate business. 2. Reliance on purchased leads. Agents have lost their ability to prospect for sellers from hot demographics, because they buy leads from consolidators. If the purchased leads are good one year, they will go up in price or decrease in the number of leads in the next year. Agents need to prospect hot seller demographics blending “new school” with old school tools like direct mail, phone, follow-up, database, and closing abilities. The value you can offer certain seller demographics should be discussed at training meetings. 3. Offer macro-economic services. An agent has the ability to offer great information on a local level. It is the only way to compete with national websites. Whether you develop neighborhood websites or a newsletter based on local statistics, honing your local value is the only way to beat national efforts. 4. Financially struggling agents who don’t understand budgeting, planning, and investing. 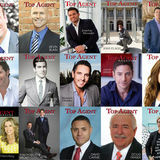 Many agents are struggling financially and they cannot devote their full attention to maximizing client satisfaction. They do whatever it takes to make the deal; they are in panic mode. With office services in place like setting up agent savings systems at close, training on tax-deferred investments, promoting real estate investing for groups, and budgeting analysis – offices have more agents who don’t live commission to commission. These agents are always better at making deals when the deals are based upon client satisfaction and not agent survival. Before you attend another webinar from a trainer or a tech guy (who never sold real estate) as they try to make your job easier – take a step back and start firming up some of the basics. Copyright©, 2016 Walter Sanford. All rights reserved.